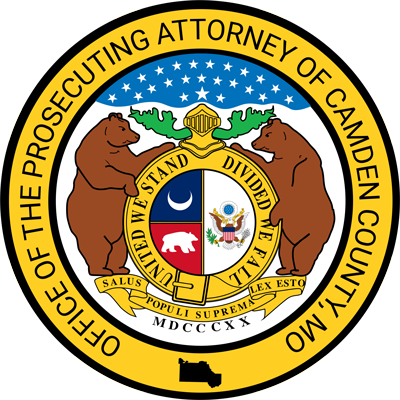 The Check Division of the Camden County Prosecuting Attorney’s Office was formed to help individuals and merchants in Camden County reduce their bad check losses through prevention and enforcement. The division also enforces Missouri’s bad check laws and collects restitution for victims of bad checks. With a purpose to defraud, he makes, issues, or passes a check knowing that it will not be paid by the drawee or that there is no such drawee. (If the issuer has an account with the drawee, failure to pay the check or order within ten days after notice in writing that it has not been honored because of insufficient funds or credit with the drawee is prima facie evidence of his purpose to defraud and of his knowledge that the check or order would not be paid). Passing a bad check is a Class A misdemeanor if the amount is under $750. the check is drawn on a closed or non-existent account, in which case the offense is a Class E felony. The check must be sent through the bank and be denied payment, either by insufficient funds, account closed, or a non-existent account. The person who took the check must be able to identify the bad check writer. The victim must provide the bad check writer’s date of birth and driver’s license number or social security number. Post-dated checks cannot be criminally prosecuted. Once the check is turned over to the Prosecuting Attorney’s Office for collection, victim should not accept payment from check writer. Prosecuting Attorney’s Office will mail a letter by ordinary mail to the checkwriter. Forged or altered checks require a police investigation before possible criminal charges can be filed. Only accept a valid Missouri driver’s license with photograph as identification. Write DOB and driver’s license number or SSN on face of check. Train your employees to make sure picture on license is the same person passing the check. Do not accept two-party checks. Do not accept post-dated checks. Do not accept out-of-state checks. Limit checks to amount of purchase. Following is a link to the documents contained in our Bad Check Packet. This packet may also be obtained by mail from our office. Welcome to the 26th Judicial Circuit Child Support Program. Our office handles Establishment, Paternity, Enforcement, Registration of Out of State Orders, and other child support related issues for the counties of Camden, Miller, Laclede, Morgan, and Moniteau. If you need to terminate or forgive arrears on your child support case, please go to www.courts.mo.gov and you can find the Affidavits under Court Forms. If you have questions about your next child support hearing or court date please go to https://www.courts.mo.gov/casenet/base/welcome.do and search by name or case number. I received a ticket for failure to maintain financial responsibility (no insurance) and I have insurance. What do I need to do? You may mail, email, or fax proof of your insurance to the attention of the Traffic Division of the Camden County Prosecutor’s Office. Your fax should include your agent’s name and telephone number, a copy of your ticket (or the ticket number), and a telephone number where you can be reached. PLEASE NOTE: If you have other tickets besides the no insurance ticket — YOU WILL NEED TO APPEAR FOR THOSE TICKETS. Can I pay out of court? For tickets having a court date for appearance, please contact the Camden County Circuit Clerk at 573-346-4440. Please note that resolving a ticket outside of court is at the discretion of the Prosecuting Attorney’s Office and some offenses may require court appearances. For tickets with “30 days” or “FCC” written in the court date field, please contact the Fine Collection Center at (877) 866-3926. Where do I go to pay my ticket out of court? The Camden County Circuit Clerk’s Office is located in the Camden County Courthouse at 1 Court Circle, NW, Camdenton, MO 65020. Please make sure that you have called and made arrangements to pay outside of court prior to arriving at the Circuit Clerk’s Office. How can I get my court date continued? Please contact the Camden County Circuit Clerk’s Office at 573-346-4440. Can I go to jail for this? The short answer is maybe. Although most traffic tickets are minor offenses and carry no jail time, some do. The Camden County Prosecuting Attorney always recommends speaking to an attorney if you have any questions. Please keep in mind that we generally do not speak to defendants—this is not because we are trying to be rude, or force you to hire an attorney, it is because we strive to protect your constitutional rights and keep you from inadvertently incriminating yourself. However, if you feel you must speak to the Prosecutor, you may always reach us at (573) 317-3910. Should I get registered, reinstated, etc… before court? Yes! The Office of the Prosecuting Attorney will always recommend a lesser punishment if you have fixed the underlying problem. Additionally, please send proof of insurance, registration, or reinstatement of driving privileges to our office prior to your court date. What if I have a Municipal Court Ticket (Linn Creek or Four Seasons)? The Camden County Prosecutor’s Office does not handle these tickets and you will need to contact the Camden County Circuit Clerk’s Office at 573-346-4440. for further directions.